Is real estate local or global? I think the answer is both. While everyone would agree that real estate values depend on location, few would buy into the idea that real estate prices tend to follow a synchronous global pattern. If one were to look at historic real estate values across multiple countries, one would find that housing booms and busts tend to occur at about the same time. For instance, during late '80s there was a housing boom in Japan, Switzerland, United Kingdom, Nordic Countries and cities such as Paris and Toronto. In all of the above examples, the housing boom eventually ended with the crash. Below I compiled a list of countries that have experienced housing bubbles in the past 30 years. Before you start reading this article, I would like you to quickly skim through the housing charts for each country and notice the pattern! Once you're finished that, it is up to you to discover all of the striking similarities between countries as well as some strange differences. 1. Germans rent, they do not own. The German home ownership rate was just 41% in 2004 but since then it went up to 59% in 2012 according to third party polls. If the last number is correct, that can be worrisome as real estate prices in Germany have been increasing since 2011 to present day. 2. Germany has a responsive land policy. It is a lot simpler to get a building permit in Germany than in the UK - where there are restrictive land policies. A good example of a restrictive land policy is a greenbelt. 3. Strict Lending Standards. The absolute minimum down payment is 20%, which comes at a premium interest rate. As a result, 40% down payments are more frequent. Over 90% of mortgages are fixed. Did you ever wonder how on earth Germany managed to bail out half of the Eurozone? The answer lies in the fact that Germany didn't have to bail itself out as it had no housing bubble. 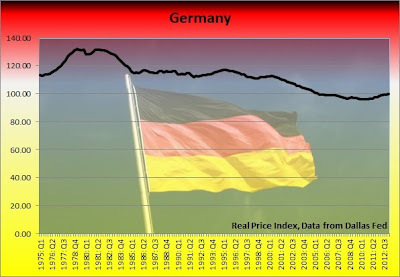 If Germany had a housing bubble, Europe would be in a much worse position than it currently is. So what caused the housing bubble in the United States in the first place? Some say it was greed, others say it was a genuine attempt by the government to fulfill every American's dream of owning a home. Bernanke famously said in 2005 that there is no housing bubble in the USA as housing reflects strong economic fundamentals. Housing prices are driven by strong economic growth, rising incomes and 40 year low mortgage rates according to Frank Nothaft (2005), chief economist at Fredie Mac. "People who talk about a bubble are blowing smoke," said real estate economist Michael Carney in 2005. Recently there was a lot of chatter about a new housing bubble being formed in the United States. Business Insider claims that the second U.S. housing bubble began to inflate in July 2012 as since then the median price of a new home has increased by $23 for every $1 in median income. 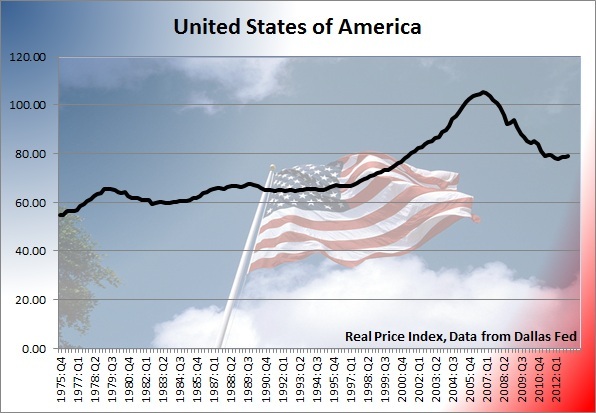 Note that since 1967 the median home price in America increased by anywhere between $3.37 to $4.09 for every $1 increase in median income (excluding the period of the first bubble). Currently, the rate of growth of new home prices is faster than during the first bubble. The question is, will this sort of price growth last? With mortgage rates going up and mortgage applications hitting a 19-month low it doesn't look like it will. As of 2013, home prices are down 27% in the UK when you adjust for inflation according to the Financial Times. Real prices are also down 15% in Greater London. Yet falling prices have not helped affordability because real wages were falling too! In places like Oxford, homes still cost 10 times the average income. 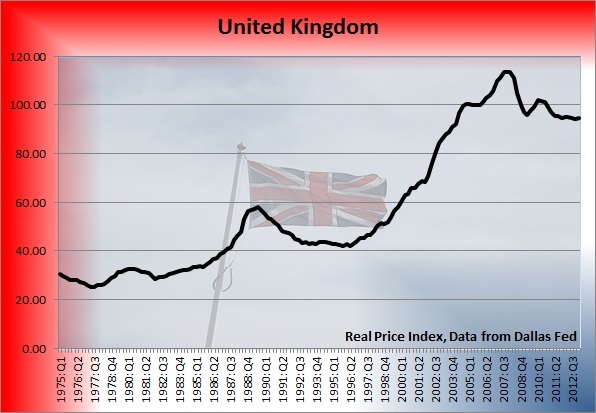 The UK property bubble still has a long way before it fully deflates. Ironically, the British government doesn't like either scenario and is doing everything it can to re-inflate the housing bubble. For example, recently the government introduced a Help-To-Buy program which includes an element that underwrites mortgages under 600,000 pounds - which would allow individuals to buy a home with a deposit as low as 5%. Basically, Brits want to replicate CMHC in Canada as to provide mortgage insurance so people can buy a house with as little as a 5% down-payment. Critics immediately pointed out that this may further increase home prices and even re-inflate the British housing bubble that hasn't fully burst yet. Other critics point out that "the housing market needs help to supply, not help to buy, and the extension of this scheme is very dangerous … the world must have gone mad for us to now be discussing endless taxpayer guarantees for mortgages." The truth is that home building in UK has fallen to its lowest level since the 1920s. The British government needs to fix its supply issue first before tinkering with the demand side of the equation. 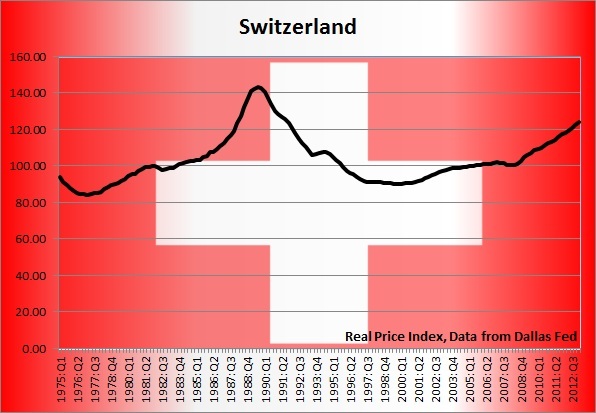 All it took to start bubble mongering was a 27.5% increase in Swiss home prices between 2007 and 2012. 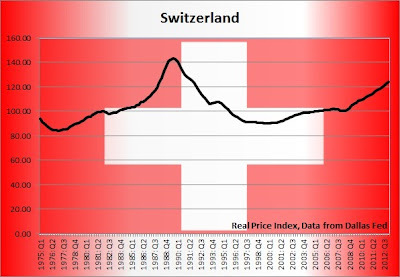 Recently the Chairman of Swiss Central Bank sparked a comment that rising housing prices may result in a housing bubble, and that a rise in real estate prices is one of the greatest threats to the economy. Yet, the central bank continues to keep ultra-low interest rates in order to prevent foreign speculative capital boosting the Swiss Frank and thus hurting the economy. Just like Toronto, Switzerland had a massive housing bubble in the late '80s. Prices had gone up by 38% from 1985 to 1989, and then returned to 1985's level by1995. Just like they are today, housing bubbles were a global phenomenon in late '80s. Real estate was considered to be a super safe investment in Spain during the boom years. Even foreigners thought so since Spain joined the Euro. In 2005, there were more houses being built in Spain than in France, Germany and Italy combined. The construction was booming, which led to a record low unemployment level in 2005. In 2006, interest rates started rising, but it took another two years for the bubble to finally burst. Before the bust, life was "good" in Spain due to the construction and housing boom! 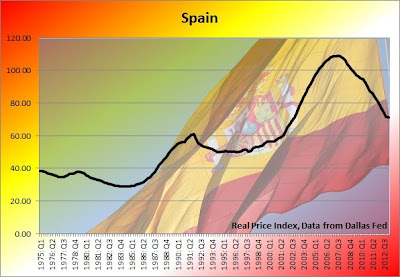 Since then Spain has returned to reality as housing prices collapsed and banks were bailed out. The problem with the banks was that during the boom years they loaned billions into the housing market which then collapsed and wiped out over a third of its value. The thing is, Spanish banks had borrowed money on international markets to lend to both home builders and home buyers who now have trouble repaying their loans. Consequently, the Spanish banking sector wasn't able to repay the money back to the international lenders, hence the bailout. Home ownership rate in Spain is a staggering 80%. Government has been consistently encouraging Spaniards to purchase property with policies such as 15% of mortgage payments being deductible from income tax. To top that off, banks offered 40 and even 50 year mortgages! With life expectancy of 82 years, one can spend more than half of their life paying down the debt! In a way, according to Alcidi & Gros, the Spanish housing bubble was financed by foreign capital which fuelled the bubble. Once the inflow of foreign money stopped, the bubble burst. 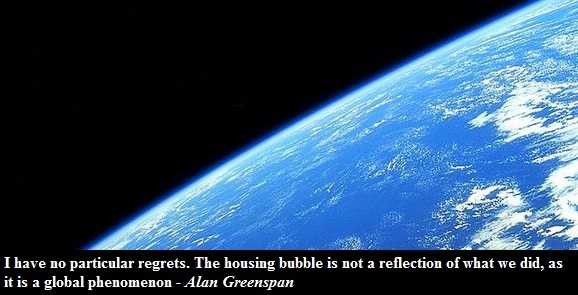 As it often happens, the high unemployment, banking sector meltdown and recession is a result of a housing bust! If the construction investment was financed by domestic savings, the Spanish financial crisis would not have been as acute. Spain still has long way to go in terms of real estate depreciation and the construction sector has to shrink further. It is very ironic that a country that exists mostly below sea level has 20% of its real estate under water. Between 1995 and 2008 real estate prices have more than doubled in real terms, and more than tripled in nominal terms. 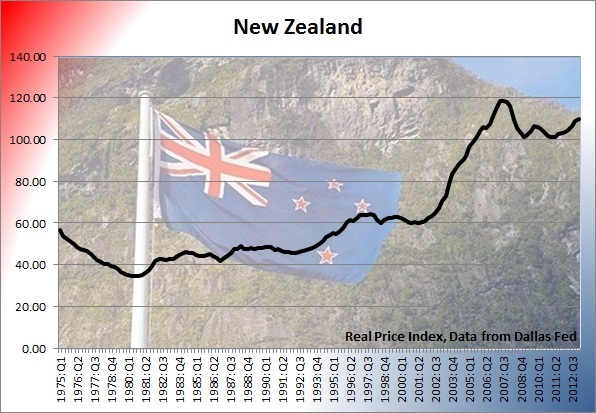 So far, national prices are down 18% from the 2008 peak and currently stand at the 2003 level. From 2012 to 2013 alone prices have fallen by over 8%. Some estimate that prices have to fall another 37% to return to the long term average. In 2012, the Dutch economy contracted by almost 1% while unemployment went up from 5.9% in Feb of 2012 to 7.7% in Feb of 2013. Recession and unemployment followed the burst of the bubble in 2008! Similar to Canada at one point, Dutch home buyers were able to finance 100% of their new homes. In fact, the loan to value ratio often exceeded 100%! It was very easy to get a mortgage for an amount five times your annual income. Additionally, mortgage interest was fully deductible from taxes which further added fuel to the fire. 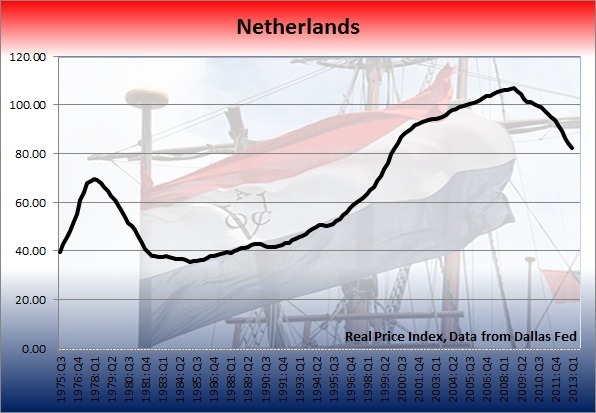 Recently the Dutch government released a report on the state of housing in the Netherlands. The report came to the conclusion that both local and national governments were responsible for the inflation of the bubble. While national government was stimulating home ownership growth via the National Mortgage Guarantee System, local governments failed to build more homes. Why did they fail? One of the reasons was restrictive land policies in the Netherlands. Another reason was that local authorities were more interested in making money rather than stimulating the growth of housing supply. Local governments were profiting from restricting new housing supply which caused housing prices to sky rocket. According to Market Oracle, there were two hysterical proposals to stimulate the housing market. The first was to artificially raise rents in order to stimulate people to buy homes. The second was to build more homes! Just like the Canada Mortgage and Home Corporation (CMHC), NMG is a Dutch national system which promotes home ownership through insuring households mortgages in case of default. Consequently banks offer the lowest interest rates to those who bear NMG insurance. NMG insures mortgages of up to EUR 350,000 while CMHC insures up to CAN $1,000,000 (when less than 20% down). 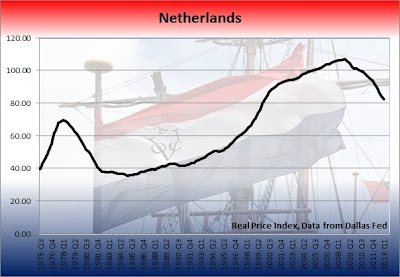 As of 2011, NMG guaranteed EUR 141B worth of mortgages or 24% of the Dutch GDP. CMHC insures over 30% of the Canadian GDP worth of mortgages. Just like in Vancouver, in New Zealand there exists a widely believed myth that the Chinese are forcing up prices as they outbid "locals". However, a recent survey of real estate agents showed that 9% of homes are sold to foreigners of which up to 5.6% never plan to move to New Zealand. Furthermore, the largest group of foreign buyers are British, followed by Chinese and Australians. The median price in Auckland rose by 11% in the past year. Some parts of the city are currently above the last housing peak in 2007. Given the recent pick up in housing inflation, IMF issued a warning that sustained rapid price growth could give rise to expectations-driven, self-reinforcing demand dynamics and price overshooting. In other words, IMF sees a risk of a housing bubble. Celtic tiger or house of cards? Between 1991 and 2001 the Irish economy was growing above 7% per year - which resulted in large expansion of the workforce. The economy was booming. Banks were lending. Home prices were rising. 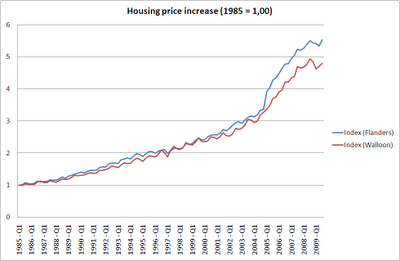 Between 2000 and 2001 Irish home prices increased by 17% alone. Around the same time IMF declared that home prices never rose that quickly in any industrial country without suffering a consecutive crash. But there was no crash in sight! Prices kept on going up year after year. Almost 13% of the population worked in the construction industry. In 2004 Ireland was ranked as one the wealthiest countries in the world and in 2005 The Economist declared Ireland to have the best quality of life on the planet. As housing prices kept rising, many financial institutions started issuing warnings that Irish property is overvalued. IMF issued several warnings that real estate is overvalued. 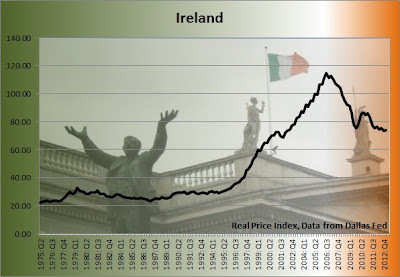 OECD stated that the Irish housing market was overvalued by 15% and even the Central Bank of Ireland agreed that property was overvalued. Ironically neither institution ever mentioned a bubble! Only the news magazine The Economist stated that there was a housing bubble in 2005. Fast forward to 2013 and Irish home prices have collapsed by over 50%. The worst hit were apartments in Dublin which lost over 60% of their value from the peak. The Irish property crash wiped out almost 260 billion Euros from the value of homes just in six years. No wonder the Irish GDP plunged by over 14% in 2008. In 2010 Ireland was bailed out by European Union as its largest banks were insolvent. As of July of 2013, the Irish unemployment stood at 13.5%. Ireland was never a tiger - it was only a house of cards! Just like many other countries, French real estate values experienced a small dip during the financial crisis before recovering and reaching all time highs. Paris is of special note as apartment prices skyrocketed by a whopping 39% between 2009 and 2011. Notice the housing bubble in Paris during the late '80s in the graph above. Now let's talk socialism. You may think that a 3% mortgage rate is low, but how about "zero". You see, in France if you qualify you can get a "zero interest loan", also known as prêt à 0% Ministère du Logement [PTZ]. In fact, since 1996 more than a million moderate-income households have made use of the zero interest loan, mainly to buy new single family homes. The loan works something like this - "in return for the agreement of a loan at zero interest, the banks benefit from a tax credit in the amount of the uncollected interest" (source). By the way, back in 2009 the French government also offered a zero interest rate loan of 30,000 € for housing renovation. Cool, eh? Back to the doom and gloom. In 2011, OECD issued a warning to the French government to curb mortgage lending. "There is a risk that prolonged period of easy finance could result in a price bubble," OECD said. 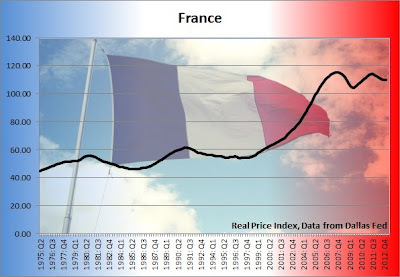 Since 2000, prices went up by 121% in France. Recently Danske Bank produced a report in which it calls the French housing market a bubble. Danske expects the national prices to drop by 10% to 20% in the upcoming years. Yet it also considers a possibility of prices rising even further which means that the 'pop' will just be larger when the bubble finally bursts. As of late, things are starting to turn south as the number of sales crashed by 42% in 2012. Yet prices are still more or less sideways. Sellers are still holding on to the delusional high valuations of their properties (as Business Insider put it, proven illusory in every real-estate bust so far). As of March 2013, sales in Paris are down 26% and prices are up 0.1%. Sales fall first, prices fall second! 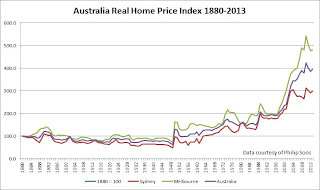 The public opinion in Australia is that there is no housing bubble. Banks, real estate brokers, insurers and the government all believe that record level housing prices in Oz are justified by the fundamentals. This sounds very familiar to Ben Bernanke saying that there is no housing bubble in the United States. Even though available data points to the biggest housing bubble in Australia to date, there is nothing to worry about, because even if there is a housing bubble in Australia, hot investor money from around the world is going prevent the bubble from bursting. 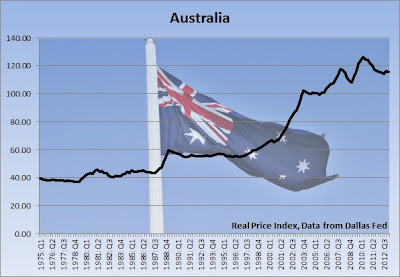 One Australian academic states that real estate has to fall between 37% and 57% in order to return to the historical average. Yet, as some newspapers point out, the housing market has been on a new permanently high plateau for the past few years. Yes, real estate may be overvalued in terms of rents and incomes, but there are many forces that militate against that such as immigration, increased costs of building houses and, of course, investor money. 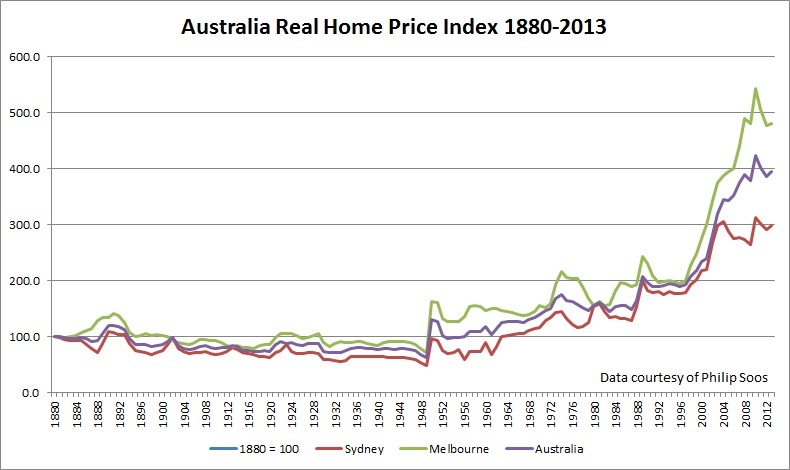 Above charts shows home prices in Australia from 1880 through today. Special thanks to Philip Soos for providing the data. Finally, here is an interesting quote from Philip: "In the debate over the housing market, it is important for those who have vested and conflicts of interest to avoid using definitions of an asset bubble so as to create confusion regarding this matter. Further, it is difficult to claim the presently low interest rates could risk causing a housing bubble when it is readily apparent one has existed since 2001." Belgium has both some of the highest tax rates and some of the most overvalued real estate in the world. The thing is, Belgians do not in actuality pay the highest taxes on the planet as there are lots of income allowances and tax deductions. As one mortgage broker put it: "The Belgian national sport is to get as much as possible allowances and create as much as possible tax-deductible costs." Of course the biggest thing that you deduct from your taxes are tax-deductible mortgages. Would you rather pay taxes to the government or put that money toward your mortgage? Obviously, all the money rushed into the housing market. But this is only a part of the story. Belgium is divided into two regions, Flanders (Dutch speaking) and Walloon (French speaking). Up to 2004, the real estate appreciation rate was pretty much identical in both regions. But by the end of 2004, real estate inflation started to diverge between the two regions, with home prices rising faster in Flanders than in Walloon. Some suggest that the reason for Flanders skyrocketing real estate appreciation rate is a revision of spatial structural plan that reduced the amount of land available for construction. The other possible explanation is the tax amnesty in 2004 that meant that there was more black money in Flanders - which is obviously a joke. Truth is, the spatial structural plan in Flanders restricts land development which inflates the housing costs for everyone else. In the end, it was the combination of high taxes/mortgage deductions, restrictive land policies and, of course, low interest rates which fuelled the Belgian housing bubble. By the end of 2012, home price growth in Belgium slowed down and real prices started to fall. In Flanders nominal prices went up by 3.4%, while real prices went up only by 1%. 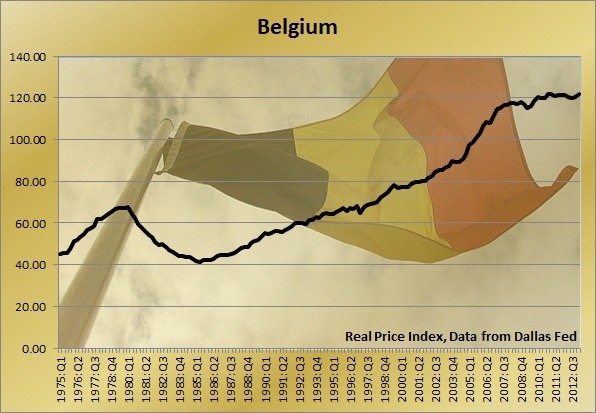 In Walloon nominal prices increased by 1.9%, while real prices fell by 0.5%. Finally, in Brussels nominal prices fell by 1.3% and real prices declined by 3.6%. Source, globalpropertyguide. 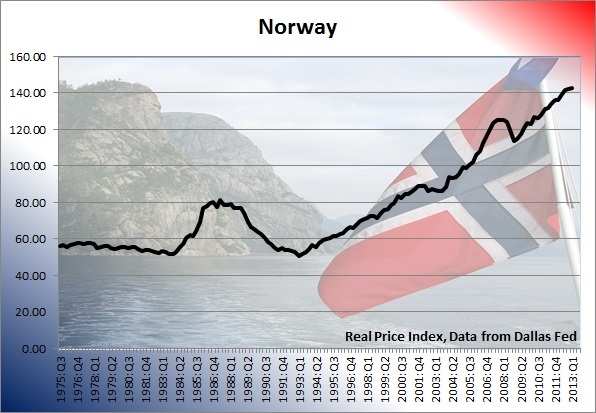 Norway's first housing bubble occurred during the mid '80s. Back then the prices fell by over 40% and left unsustainable debt levels. In the years leading up to the first housing bubble, household debt was at 150%. Currently household debt in Norway is over 200% - which is double that of Germany and a third higher than the US during housing bubble. Norwegians have a home buying incentive as there is a 28% tax deduction on mortgage interest. 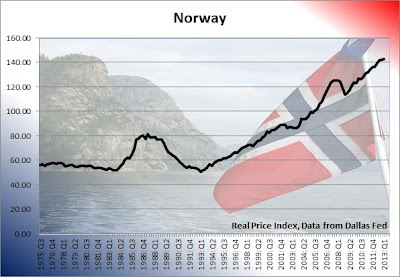 IMF says that real estate in Norway is overvalued between 15% to 20%. Price-to-income ratio is 28% above the historical average and even higher than before the Norwegian housing bubble of late '80s. IMF further warned that a housing bust would result in depressed economic conditions and increased financial sector stress. If housing prices fall by 10%, it would cut GDP growth by 1% and leave banks vulnerable. As in many other countries, the Norwegian finance minister keeps on warning of increased household debt and surging real estate prices. Even the prime minister of Norway warned households that they are repeating the same mistake of the mid '80s. The Norwegian finance ministry recently considered raising the risk-weight floor for mortgages to 35% which is more than double what Sweden recently introduced. In other words, Norway is preparing for the coming housing bust by requiring its bank to set money aside for the future housing losses. You would think that Fins would've learned from their first housing bubble in the late '80s and early '90s and avoid repeating history. But this is just not the case. Yet again low interest rates are fuelling another housing bubble - this time in Finland. In the short term it looks like Finland has avoided a severe crash - such as the crash in Denmark - due to the collapse of the Euribor rate to almost zero. With almost 100% of homes being financed by variable interest mortgages, the Finnish housing market is extremely vulnerable to an interest rate hike. To top that off, household debt has risen from about 65% in 2000 to almost 118% in 2012. "I'm very worried. 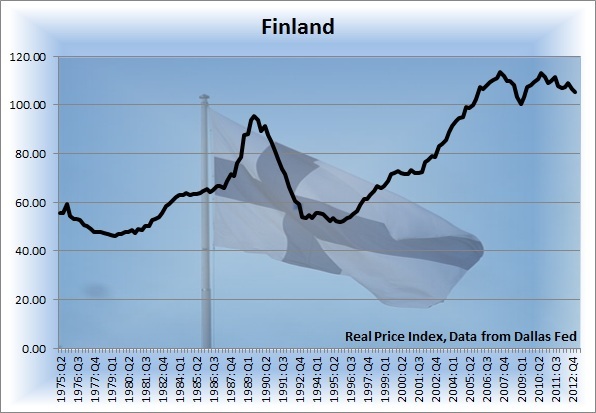 There could be a housing bubble in the making in Finland. There is a risk that mortgage borrowing costs are too low." said Finnish Finance Minister Jyrki Katainen back in 2010. While it may seem that the Finnish property bubble is a direct result of Finland being part of the Eurozone, I don't think this is the case. While it is true that low Eurozone interest rates have added fuel to the fire, you have to keep in mind that other Nordic countries such as Sweden and Norway also have giant real estate bubbles without being part of the Eurozone. Some analysts point out that Finland may replicate Japan's housing crash due to their export driven economy and aging population. Danes are the most indebted in the world. Hooray Canada! Our 165% household debt is nothing compared to 267% household debt in Denmark! 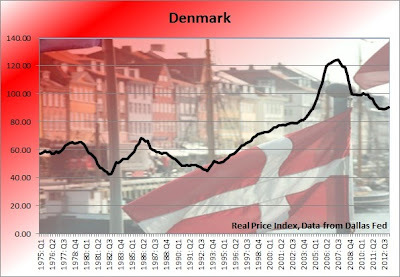 Since the Danish property bubble burst, household net worth declined by nearly $70,000 US since 2007, and the real estate crash is nowhere near being over. In 2012, the Danish economy contracted half a percent! During the onset of the bubble, the average apartment in Copenhagen had been increasing in value by about 2,000 euro per month. This is a bit higher than the average after tax income in Copenhagen. As one blogger put it, "you could make the same amount on your house each month as you could by going to work." In 2006, OECD published a report on the Danish housing market where it stated that there was a mismatch between housing needs and use. Yet the report never mentioned anything about a potential bubble or the market being overvalued. The only thing that the report mentioned that foreshadowed an eventual market collapse was the word "overheated". It seems that organizations such as IMF or OECD hesitate to use the word "bubble" even though it's obvious that there is one. 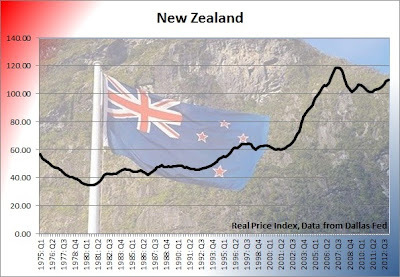 Back in 2010 a Danish Investment Bank warned of tremendous housing bubbles in Canada, Australia, New Zealand, Sweden and Norway. 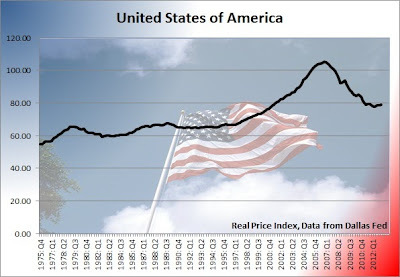 In the bank's opinion, each of the above listed countries has a significantly worse housing bubble than the United States in terms of price appreciation from 2002 levels. Well, I suppose an investment bank in a country which is undergoing the burst of it's housing bubble would know how to spot the symptoms of one. Do you want to hear something crazy? It takes 140 years to repay a mortgage for the average Swede. Now that is an investment. 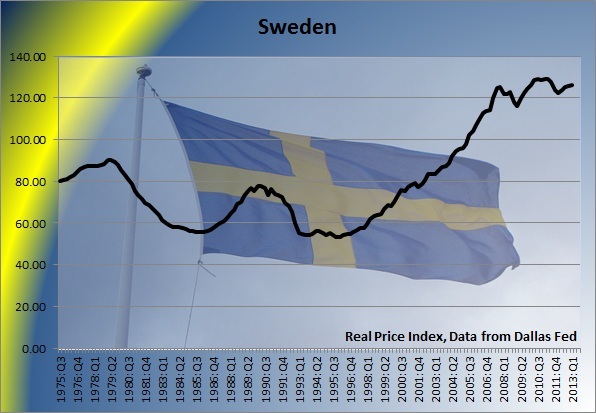 Swedish real estate jumped 38% since 2007 and that made the government worry. In 2010 the Swedish government introduced a mortgage lending ceiling which caps the equity that can be withdrawn at 85%. Between 2004 and 2008, Swedish household debt was growing at an astonishing 10% per year but recently slowed downed to about 4.5%. The household debt reached 173% of disposable income which is way above the 135% that was reached during the peak of the last housing bubble in late 1980's. 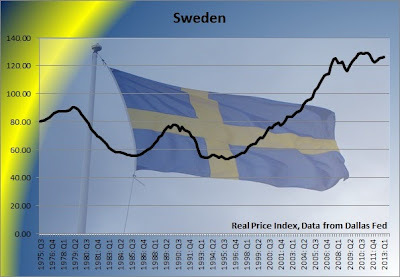 Finally, according to Sweden's National Housing Board, Sweden is experiencing a housing bubble as real estate is overvalued by 20%. “What we saw in the 1990s crisis was that if you bought a home with a 90 percent debt ratio in 1991, it took about six or seven years until you were back at a level where you had a property that was worth more than your mortgage,” - Martin Andersson, the director general of the Financial Supervisory Authority, said in an interview in Stockholm. Just like in Canada, the Swedish government is consistently reminding citizens of the record household debt. A chairman of Sweden's biggest bank, Nordea, recently bought an apartment in downtown Stockholm in order to prove his point that there is no housing bubble in Sweden. I bet that the cost of buying an apartment is way smaller than the potential financial impact on his pay check once the Swedish property bubble bursts. In the meantime, a new report by several real estate companies states that there is no housing bubble in Sweden and that the market will remain strong. Lately, Sweden is preparing for its housing crash and for the financial nightmare that it is going to bring. For example, Swedish financial regulators recently tripled the risk-weight floor for mortgages to 15%. In other words, Swedish banks now have to set aside triple the amount of money to protect against housing loan losses. 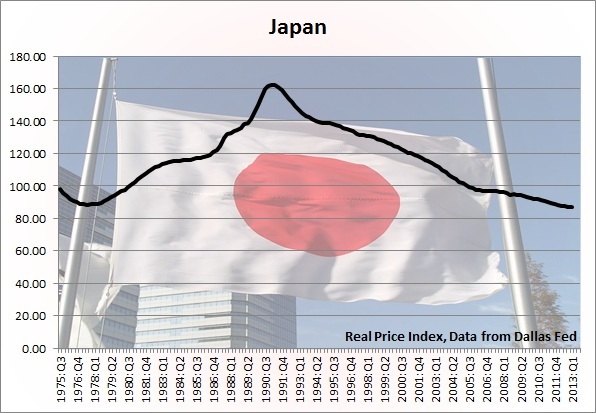 At the height of Japan's housing bubble, prices were so expensive that the 100 year mortgages were created to finance purchases. Imagine that - a century long mortgage! Lifelong debt slavery for you and for your kids! Yet during the peak of the bubble, this type of mortgage was viewed as a good thing. Back in 1990, CNN called a 100-year loan "sound fiscal planning". Japan's housing bubble originated in Tokyo and then it spread like cancer to Osaka and many other rural cities. In some Tokyo neighbourhoods home prices were 350 times more expensive than in comparable neighbourhoods in Manhattan. At one point, it was rumoured that the land beneath the Imperial Palace was worth more than the land of entire state of California. Then came the crash. In just one year NIKKEI stock exchange lost 50% of its value and consequently that blew up Japan's housing bubble. It was the beginning of the lost decade - which eventually turned into lost decades. For more information on Japan's Housing Bubble I suggest you visit Jesse's Colombo website. While there is still a lot of debate inside Canada of whether there is a housing bubble or not, many foreigners have already made their verdict: Canada is doomed. Furthermore, Paul Krugman recently declared that Canada is headed for a de-leveraging shock. A recent analysis by American Motley Fool is yet another nail in the coffin with its comparison of the US property market to the Canadian property market - stating that Canada is not much different. So what is it that the foreigners see that Canadians are so oblivious to? Firstly, between 2000 and 2013 prices have increased by over 140% while the incomes have lagged on. 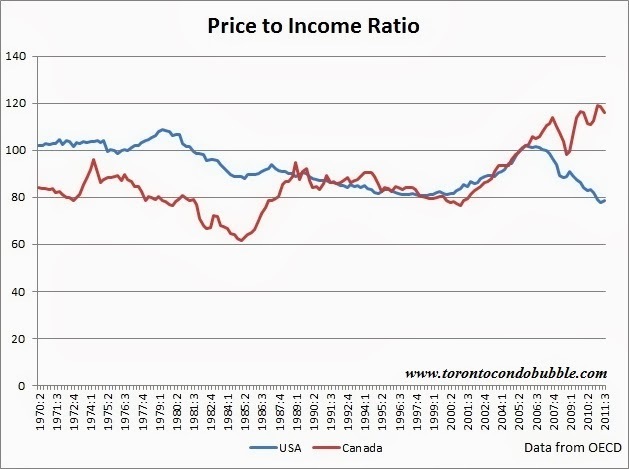 In terms of price appreciation, the Canadian housing bubble is bigger than the that of the US. Secondly, Canada introduced a "zero" percent down payment and the 40 year mortgage back in 2006 which was eventually scrapped. In a way, it is a Canadian sub-prime. Thirdly, the CMHC - which insures mortgages and is the Canadian equivalent of American Freddie Mac and Fannie Mae. 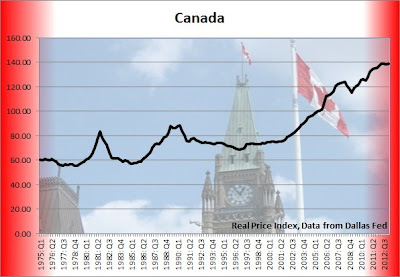 Without the CMHC, Canadian housing prices would have never increased as they have. Fourthly, emergency interest rates introduced in 2008 prevented the housing correction to fully take place. Fifthly, the country wide belief of real estate being an investment. 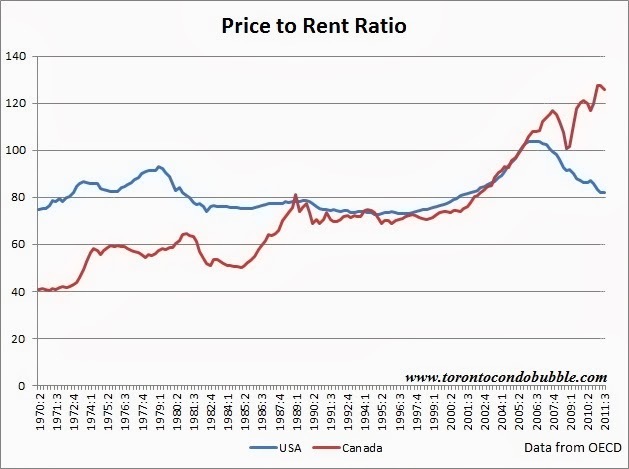 Lastly, home prices being overvalued against rents. All of the above points are warning signs of the bubble. 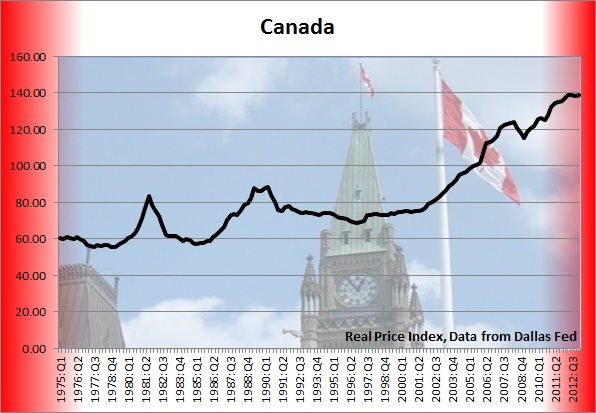 Oh and by the way, IMF, OECD, and Fitch stated that Canadian housing market is overvalued. Note: This article is a work in progress. I will keep adding information on existing countries as well as adding countries with housing bubbles. If there are any mistakes in this article please send me an email or leave a comment below.